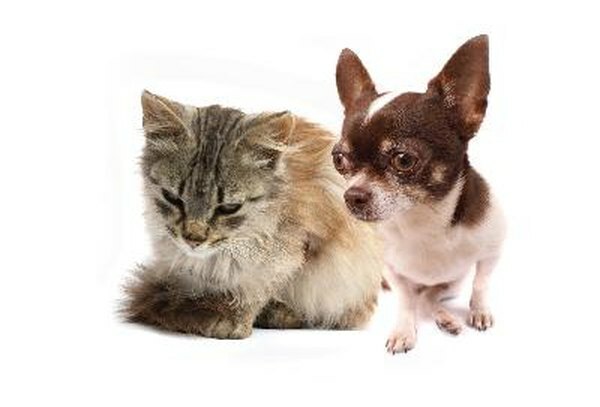 Cats and dogs can both catch human colds. Dogs, cats and humans share a litany of cold symptoms -- stuffy noses and irritability, for starters -- but the underlying causes are usually alien. Pets and people can share a few viruses, but common cold culprits aren't typically among them. Some cold-like symptoms, though, may mask a transmissible illness. A variety of germs are responsible for the common cold in dogs and cats, just like in humans, but they're not the same viruses. Most respiratory infections -- and most viruses, for that matter -- are species specific. Many common dog colds come from canine flu virsuses and bordetella bacteria; many common cat colds come from feline herpes and calici viruses and bordetella bacteria; and many common human colds come from rhinovirus. When you catch a cold, you don't have to worry about getting your pets sick. Speaking broadly, many veterinarians note that dogs and cats can't catch human colds. The H1N1 outbreak of 2009, however, challenged that conventional wisdom when at least one cat (and two ferrets) apparently contracted swine flu from humans. In an article in The New York Times, Dr. Brett A. Sponseller said there's no evidence that transmission from cats to humans is likely, as afflicted cats don't cough or sneeze. Following the cat incident, Sponseller got several calls from concerned pet owners, according to the article, which suggests this wasn't the first ever case -- just the first confirmed case. While the germs that cause most colds and flues are species specific, some that cause cold- and flu-like symptoms are up for grabs. Certain varieties of streptococcus -- which causes a sore throat -- are infectious among dogs, cats and humans. You may not know if your pets have it, though, as both cats and dogs can be carriers without exhibiting symptoms of infections. The vector direction of shared diseases is typically from pets to humans -- such diseases are called zoonoses -- and not the other way around. People usually contract zoonoses through contact with animal saliva or feces. 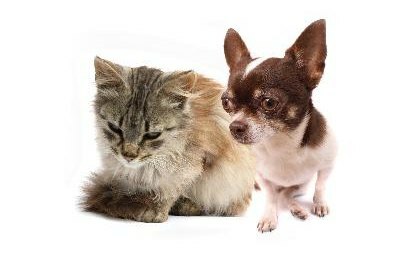 Disease-carrying pets may not display symptoms or may simply be hosting relevant fleas, mites and ticks. Common zoonotic diseases and parasites transmitted from dogs and cats to humans include rabies, ringworm and intestinal parasites. Cat scratch fever, salmonellosis, roundworm, hookworm and toxoplasmosis are other common examples. Infants, pregnant women and people with compromised immune systems are at higher risk of contracting these diseases. Best Health: Can Cats and Dogs Catch a Cold From You? Vetiology: Can Dogs Get Colds from Humans? Cornell Feline Health Center: Zoonotic Disease -- What Can I Catch From My Cat? The New York Times: Consults -- Can Pets Get Swine Flu?